Yippee, it's good to have things back to normal again! Computer problems over the weekend had me in a mad scramble to try and copy all irreplaceable files, not knowing whether I'd be losing this computer and having to buy a new one or not. But, thanks to the consistently super-fantastic eMachines tech support, I can hang in there with this machine for awhile longer. And it runs so much better. Enough of that and on to the fiber stuff. 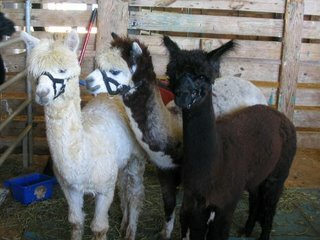 DH made it possible for me to attend the Southeastern Animal Fiber Fair (SAFF) over the weekend. It's been 2 years since I've been able to go so I was delighted to spend the day seeing old friends and immersing myself in all things fibery. The drive to Asheville, NC was lovely. The weather was perfect and the autumn color, though just past peak, was still glorious. This year's SAFF was the best I've seen. There were more vendors, more workshops, more demonstrations, more people, and less parking than before. 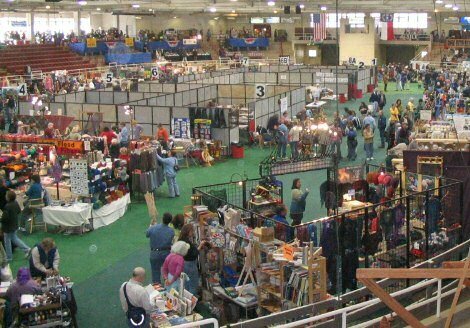 This is a shot of the inside of the main arena, where the vendors and workshops are. The workshops are held in the partitioned areas in the center, and vendors are packed into the different levels. The nice thing is that the arena is covered, so that rain isn't a problem. I would have liked to have taken Eileen Hallman's point spinning workshop, but our transportation situation prevented me from knowing whether or not I'd have a vehicle for the weekend. As it was, it was a last minute spontaneous decision to go anyway. ..... I loved the spinning wheels and couldn't resist taking a pic. I went with a shopping list but didn't buy a lot. Typical for me, I got quite overwhelmed at all the beautiful fibers, yarns, tools, garments, projects, etc., and become exceptionally indecisive. ...... some clean California Variegated Mutant fleece from Delly's Delights Farm who traveled all the way from Trappe, MD. 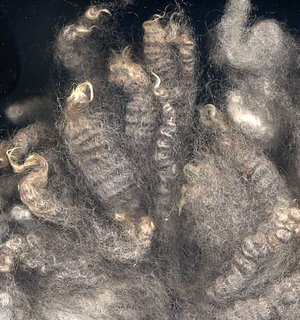 Now I'm trying to figure out how to squeeze it into my Rare Breed Sweater, for which I already have plenty of samples! The best part of SAFF was getting to see friends. From the Blue Ridge Spinners I saw Carol, Mary, and Eva. From the Western North Carolina Fiber/Handweavers Guild I saw Betsy, Pat, and Charlene (though Mary and Eva are members of this too.) Betsy was my weaving teacher, so I was especially glad to visit with her. She is still just as encouraging as ever. It's fun how an event like this can be so inspirational. It's refreshing as well as energizing. Now all I have to do is put that inspiration and energy to work. 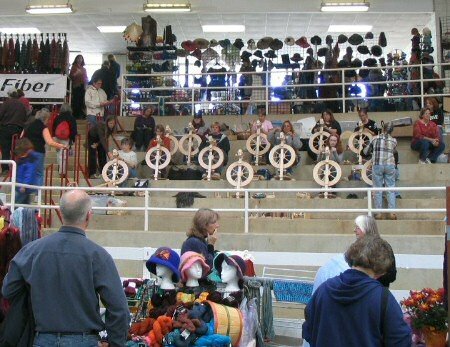 I am so jealous, especially when I saw the picture of the vendors. Ohh, SAFF has wonderful wonderful vendors.....Sob.... But I am glad you got to go! Ooo, a matching RB hat! What an excellent idea! I should have lots of odd leftovers. The festival looks like fun- love that beginning spinning class up in the bleachers! Thanks for the weaving book suggestion- I'll check it out, it sounds great. I went to SAFF on Sunday morning. Sorry I missed you. Mary gave me your blog site. I'll check in with you often. Looks like you had an amazing time. Lots of yummy, soft, wooly stuff in one location. Ah, one day I'll be in the US at the right time of year for that. Glad you had a good time. Gail, we went on Saturday. I would have loved to have seen you! It looks like a great time! But "Mutant" fleece?